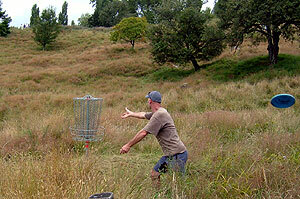 Turning up at Brook Park in Te Kuiti as the morning round of Doubles players were coming in with stories of long grass and lost discs, I felt for the joint TD’s Simon and Nigel H.
Christmas Special - Andrew Taylor (Tauranga) is already trying to 'lean' his disc back to the right towards the group in front who are just below the basket target. They had made late changes to the course already after many players had dropped by for a practice round and found the layout a little more than testing, and on top of that the local district council had promised to have the park in pristine condition for what should have been the biggest and highest profile event on the National tour and had sadly let them down. 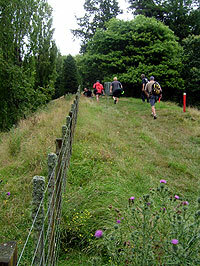 The grass was waist high and the hidden undulated terrain was waiting to test the strongest of ankles. Scarface Got Nothing on This! 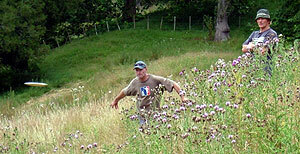 - Bruno Whale(Taumarunuia) is showing signs of disc recovery after an initial recce of the course.. 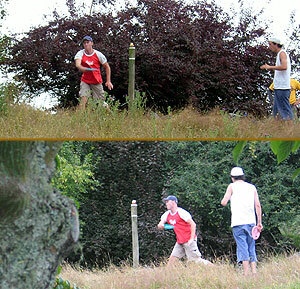 Most players were happy with the course but spotters were needed on most holes to help speed up the rounds. I would also like to note that a true test for Disc Golfers is not just about who can throw the longest, it’s nice to have a course that tests your up shots and placement, not to mention your putting skills. To that end it was sad 8 year old Toby couldn’t be expected to make his way around Brook Park and missed his first Nationals in 5 years. Also it was only after problems in the opening round that woman’s tees were added on some of the very long holes. I feel it’s important to cater for all divisions if we want our sport to grow. Maybe that’s the reason we sadly only had 22 players at Te Kuiti? The Fenceline Tour - Keen golfers walk up the fairway of hole 7 where Simon Feasey scored an ace - but into the wrong basket! He potted his drive into the chains of hole 5 down the left bank!!. Any way I digress... After the two rounds of doubles on the Sunday it was the Wellington pairing of Dylan Cooper and Matt Cutler who held off a strong challenge by the Lost Tribes Blair Joins and son Bruno to take it by 1, with another 3 shots back to Speedo Keene and Josh Smith in third. I followed around the pairing of Juan Unda and Marty de Haas and never before have I seen as many foot faults called ... all by Juan against his partner ... Something’s just not right there..! When it came to the singles competition my thoughts that par would be a good round was pretty much on the mark. If you could get par or slightly better you would probably make the top group. Surprise surprise Simon came in with a 53, Blair a 54 and Dave Keene a 56, Fish and Dylan Cooper were next best on 58. By the time the cards came in after round 2 Simon still led by 2 shots over Blair with the top group for round 3 the next day being made up of Dylan on 114 and Seip tied for 4th at this stage on 115. After the morning round on the final day the only change to the top group was Dylan slipping back to the second group and yours truly making the top 4 for the final round. There was only 1 shot separating Simon and Blair and daylight back too the rest of us. It was a great round to be part of with Blair’s challenge to Simons lead on right until the last putt on the final hole of the tournament. Oh and just when I was thinking 3rd overall was pretty good for an old fella, Speedo Keene comes in with a course record 51 to slip past Seip and my self to take the third spot on the podium. Congratulations to all who competed and the divisional winners, Simon the Open, Ming the Woman’s, Yours truly the Masters, Pete Boyle the Grand Masters and Bruno Whale the Under 19’s. The Completion Backwards Principle - Juan Unda (Tiauana) shows his crazy technique that he keeps in storage for when is partner annoys him. We saw a bit of this at the Nationals as he was forced to endure teaming up with the Dev himself, Marty de Haas. "That's Not What I Told You To Do!!!" 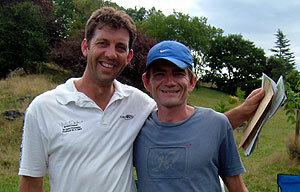 - the odd couple of Juan Unda and Marty de Haas continued their slippery slide to doubles disaster right to the 18th. Here the Dev ignores the experienced advice of the Mexican Wonder ("Lay up like the woman you are") and has the audacity to put his disc in the chains from 30m. 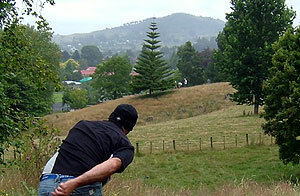 Three D: Dylan Drives Desperately - Here we see our special double angle technique of Dylan Cooper (Austria, I mean Wellington) at the first tee. Note the poise, the control, the determination. And that's just Bruno watching! 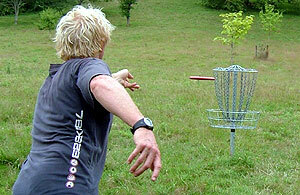 Flat - Marty de Haas (One Tree Hill) shows full confidence on the green to fire a solid putt direct at the chains. In The Pocket - Siep Van Vliet (Waiheke) is back into firey form as he leaves his shoulder injury behind him. A highly creditable 5th place in these Nationals has us seeing him right up the ranks in the Tour. I'm Finally On The Site! - Young hopeful Dave "Speedo" Keene (Auckland) fired a Brook Park course record 51 on the 4th and last round to leap into third place from the second group. Nice one. For his performance he was rewarded with a disc - colour of his choice - huh?. 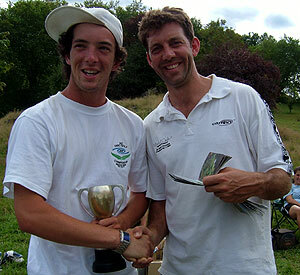 Junior Champs - TD Simon Feasey congratulates top junior Bruno "Scratch" Whale (Taumarunui). 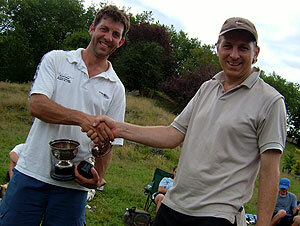 Happy and Grumpy - See Bob Gentil (Auckland) winning the Masters prize from Simon. See Marty spitting the dummy over the fact he thinks Bob should be playing in Grand Masters so he would have a chance at the Masters. A New Winner for a New Prize - This year saw the introduction of the first Handicap Trophy, calculated in true kiwi tradition with a piece of number 8 wire. 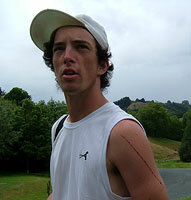 Siep Van Vliet (Waiheke) took this one out with his great come-back form after a 2006 plaqued with injury. 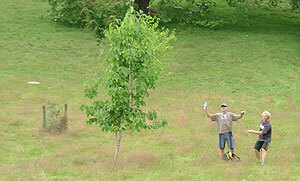 Brook Park - An absoulte gem of a park that has been developed over many decades with more examples of tree species than discs in Bob's bag - that's a lot! 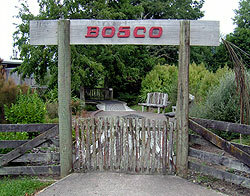 Bosco - And as if the fine park was not enough, we had the Te Kuiti hospitality of Bosco Cafe which boasts a pleasureable garden right on the park edge. 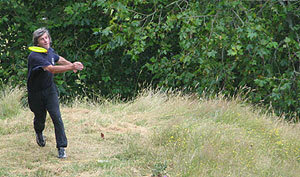 Pouncing Tiger - Blair Joines looks to have had enough of 2nd place and has hit 2007 with some ripping form. Oh, and he came second..
Damsels with Discs - all golfers were in admiration of the Allie Joyut and her sister Robyn who braved the testing conditions of Brook Park for two rounds of doubles. Didn't they do well?! Good To See You Again! 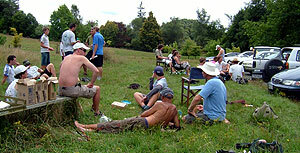 - Disc Golfers from the Land of the Great Long Drive gather to enjoy the beauty of the Central North Island. Te Kuiti, New Zealand. Wish I Had 'Fauna' Better Shot! 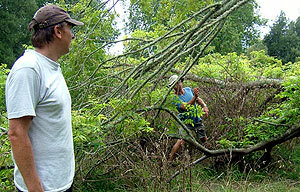 - Some of the tee box areas that were used utilised a lot of what Brook Park is about - a display of fauna. 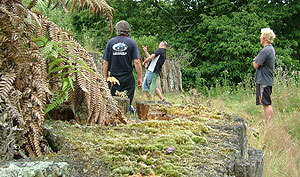 Here that kiwi icon, the fern, grows on a tree stump at the 12th as Andrew Taylor (Tauranga) forearms watched by Marty and Des. Note the moss growing due to inactivity - not on the tree, on Marty's driver (he had Juan Unda as a partner and rarely needed to drive). 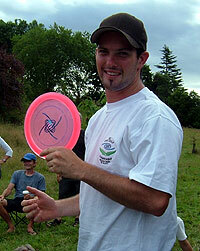 Worlds Bounded - Des Cooper (Taumarunui) has been a regular face on the NZ Disc Golf circiut since, well, the depression. And the world will be exposed to the long haired harrier later in 2007 as he heads to his first worlds. Look out USA!!. Its Not Just All About The Golf - After a few rounds of intense golf, the lads always like to get together in the smallest room possible. Here the boys and girls congregate for the Black Caps game against Australia - and to watch Speedo Keene blow up a double bed with nothing more than a couple o' lungs. No Rooms For Bikes! - Its all over and baskets were collected to be stored for the next event. 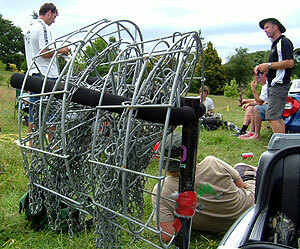 All the disc golfers of New Zealand look forward to the day they won't need to transport basket targets from place to place. Lets get permanent courses throughout Godzone! 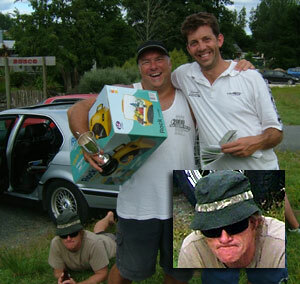 More Madhatters - Its those two loonies again, Juan and Marty. This time on the 7th, Juan goes all out for a 60 foot 'approach' shot. As usual, the Mexican's accuracy was uncanny, but his awesome power was too much for the chains and his dead centre shot bounced off the pole. Marty, in his usual unappreciative style, lambasted his partner for, well, being too good. Top Woman - And she came first too! 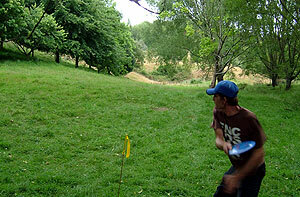 Congratulations from TD Simon to Ming Menzies (Tauranga) for taking out the title of 2007 New Zealand Womens Disc Golf Champion. Nice One Buddy! 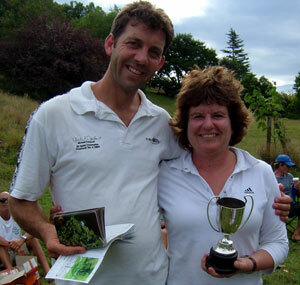 - Tournament co-TD Nigel 'Waiheke' Hailstone hands Simon Feasey his 6th straight Nationals title. There has been some close ones, just like this one, but Simon has held on every time. Great golf.